Day Trip from Camerons Cottage to Inverewe Gardens. A round trip of about 200 miles. A good 6 hour trip. Leaving Camerons Cottage turn right and drive along the B852 with the Loch Ness shoreline on your left. Continue along the B862 from Dores into Inverness. From Inverness take the A9 north crossing the Moray Firth via the Kessock Bridge and onto the Black Isle looking out for buzzards and red kites. Continue to the next roundabout [the Torr Roundabout] and take the second left onto the A835 signed to Ullapool. The road crosses the very end of the Cromarty Firth and bears left towards the village of Contin. Just after the village there is a car park with toilets on your left and is a good place to park and stretch your legs to watch the Black Water River cascading over dramatic rock formations.A good relaxing walk along the side of the river listening to the water cascading over the rocks. Continue on your journey following the Black Water River on your left until it eventually goes under the road. The uphill journey now takes you through heather moorland and under towering snow capped mountains. Pass smaller Loch Garve and then the larger Loch Glascarnoch on your right. Notice the black & white snow poles topped with red bands on either side of the road helping travellers to know exactly where the road is in winter months when everything could be covered in very deep snow and often impassable. Just before the Corrieshalloch Gorge sign turn left onto the A832 signed to Inverewe Gardens. All the time you will be driving through some stunning scenery of imposing snowy mountains several of which are Munros [mountains over 3,000 feet] making you feel very small and insignificant. Drive along the side of the sea loch Little Loch Broom which runs parallel to Loch Broom, on which the fishing village of Ullapool is situated. Near to the sea entrance of Little Loch Broom, just after the sign to Badcaul, you will suddenly come across a large unsigned flattened parking area on the right with a breathtaking panoramic view of the sea mouth which is an ideal place to stop for a spot of lunch and for excellent photo opportunities..
Continue on the A832 for about 8 miles and drive alongside Gruinard Bay. Pass two smaller beaches, the first of which is fenced off and private. Travel on and park in the small car park opposite the next larger beach looking out onto several uninhabited islands with a magnificent backdrop of snow-capped mountains. The views are amazing and the beach has a crescent of white, clean sand. Stroll along the sand or dip your toes in the cool sea water.Continue on your journey passing tiny hamlets appropriately named 'Second Coast' and ' First Coast'. Drive over the peninsular and admire the amazing views as you drive along the side of Loch Ewe for quite a distance. At the end of Loch Ewe pass are the very popular Inverewe Gardens. 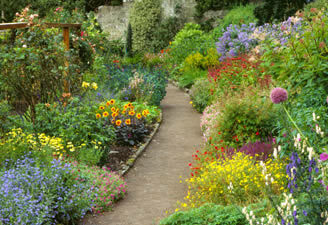 These National Trust Gardens are known for their exotic plants and world famous walled garden. Walk for 45 minutes along the Pinewood Trail which offers superb views of the Inverewe Estate and Loch Ewe.Inverewe Gardens with its large car park are open all year and offer a self-service restaurant, visitor centre, book shop and gift shop which are open from early spring to late autumn. Look out for the new Wildlife Hide. You are now about half way through your round trip...100 miles from Camerons Cottage. Travel on through the village of Poolewe and cross over the peninsular to look upon the large settlement of Gairloch overlooking stunning Gair Loch. For the scenic return journey home continue on the A832 passing the turn off to Shieldaig and drive along the side of lengthy Loch Maree and several smaller inland lochs all the way back to Garve. Here turn right onto the A835 back to Inverness crossing over the Black Isle. Home to Camerons Cottage on the B862.